I am now 87 years old and have learned and known many of the deep workings of God in the hearts of His children. We continue to find truths as they are revealed by God’s answer to the cry of our hearts. We each, as servants of the most high God, press on the upward way. There is no stopping place and the longer we serve Him, the sweeter He grows. We will never reach the end until we finish the race and God calls us home. Then we shall be made perfect as “mortality puts on immortality”! Let us press on the upward way; new heights we’ll gain day by day. Praying as we’re onward bound, Lord plant our feet on higher ground. But while I swayed, weak, trembling, and alone, the Everlasting Arms upheld my own. But while I sat in shadow, wrapped in night, the face of Christ made all the darkness bright. But while the battle raged, and wild winds blew, I heard His voice and perfect peace I knew. Giver of good, so answer each request, with Thine own giving, better than my best. Have you started for glory and Heaven? Have you left this old world far behind? In your heart is the Comforter dwelling? Can you say, “Praise the Lord, He is mine”? Have the ones that once walked on the highway gone back, and you seem all alone? Keep your eyes on the prize, for the home in the skies; God is still on the throne. His promise is true, He will not forget you, God is still on the throne. Burdened soul, is your heart growing weary with the toil and the heat of the day? Does it seem that your path is more thorny as you journey along on life’s way? He will lighten your care, for He still answers prayer; God is still on the throne. He’s the Architect true, and He’s building for you; God is still on the throne. Does His tarrying cause you to wonder, does it seem He’s forgotten his own? His promise is true, He is coming for you; God is still on the throne. 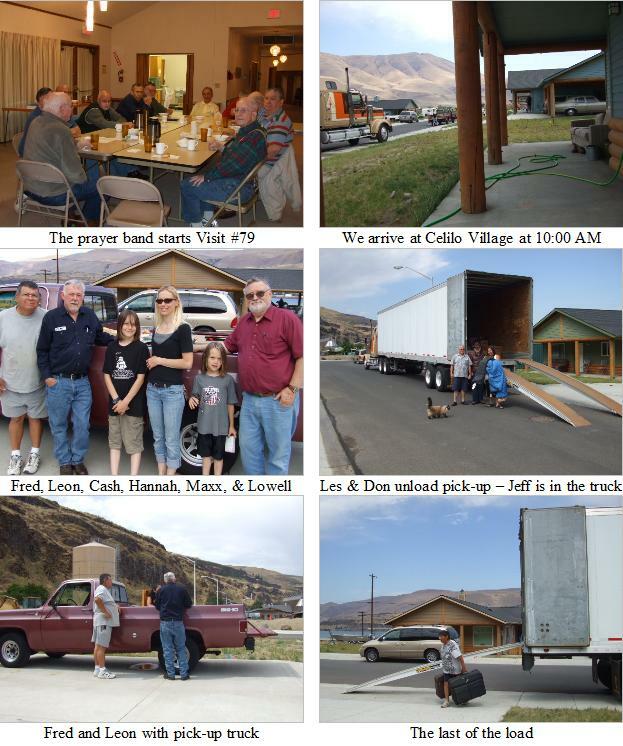 At 6:00 on June 25th, Leon Hansen and Shaun Robertson left with Leon’s well-loaded Dodge pick-up for Burns, OR to visit the Burns Paiute Indian Reservation. They were warmly welcomed by Betty Holly and her sister, Olivia, who gratefully received the groceries, detergent and toilet paper they had requested on Leon’s prior visit. 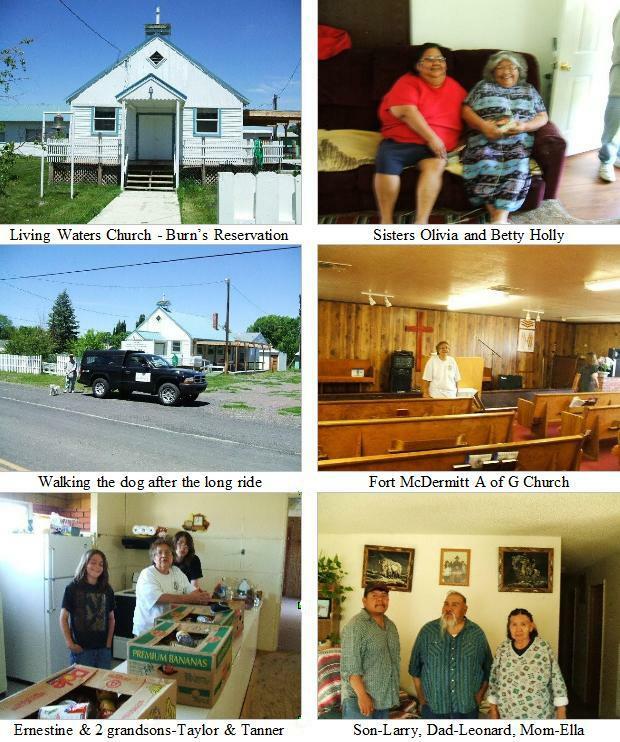 After lunch, Leon hurried on to the Fort McDermitt Reservation and into the Assembly of God Church on the Nevada side of the reservation. Sister Earnestine Coble is our point person and retired pastor, Gene Luttman, gives aid as he is able. Our team visited homes, passing out boxes of food, Bibles, tracts, coloring books, and other items which were gratefully received as we gave them our witness of Jesus and His love. They asked us to come back and it is our plan to do it once again this year. Friday, July 10th, dawned bright and clear. Lowell Bradford and Alan Sasaki had the oatmeal, bran flakes, OJ, coffee, and doughnuts all in place at 7:00 a.m. What a blessed way to start a mission visit; a time of fellowship and eating together, then sharing burdens and praying for each other and for our outreach to Indians. At 8:00 a.m., Les Phipps, Jeff Phipps and Don Cline headed out in the Big Rig followed by Lowell and Leon. Hannah Cote and her sons, Cash and Max, in their car made up the team for a visit to Celilo Indian Village. Arriving at 10:00 a.m., we unloaded the nice Chevy pick-up for Fred and Karen Whitford, our point people, then gave them food and household items for their ministry. Our team knocked on each door of the 14 houses there with food and witnessing. What a wonderful day; we praise the Lord! On Saturday, July 18th, drivers Jeff and Les Phipps, and old missionary Don Cline, in the back seat of the Dodge Diesel, drove north of Seattle to the Tulalip Indian Reservation. 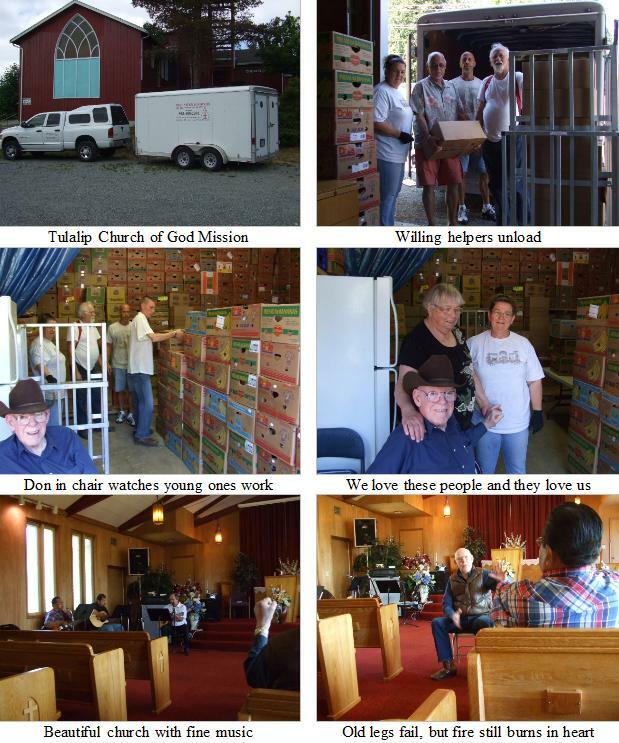 The Wells Cargo trailer was fully loaded with food for the Church of God Mission Food Bank directed by Sister Frances Morden. As always, she had a fine team of helpers to unload us. Sunday, we shared God’s word and our burden with these fine people, who are pastored by Rev. Emitt Thrower, and then we made our way home to Portland. On Saturday, August 1st, First Nation Ministries visited the ROAR camp meeting for the second time. ROAR was born in the heart of evangelist Aaron Auer. God awakened his heart to search out Oregon’s wonderful spiritual heritage. He started at the stature of the circuit rider at our state capitol. He found that Oregon’s founding fathers and spiritual leaders gathered together in 1844 to praise God for His blessing on them. 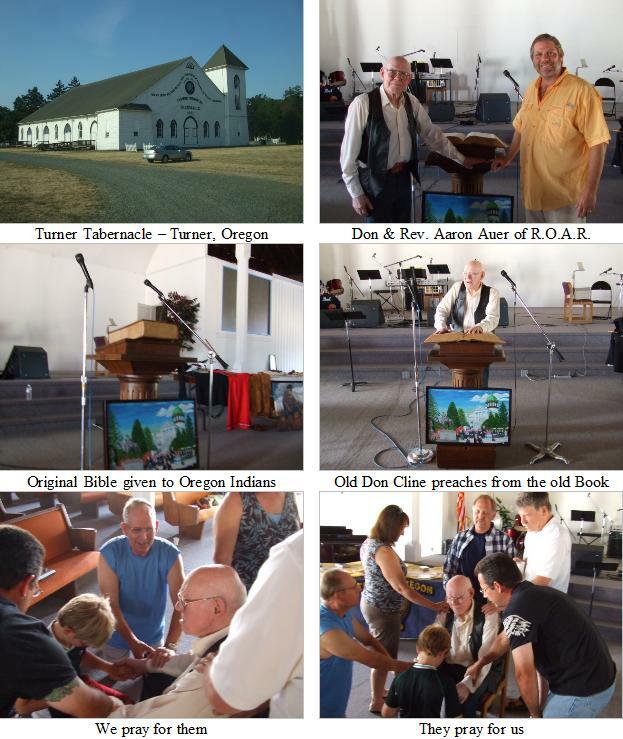 They met at Turner, Oregon and continued a camp there for 47years when, in 1891, they built their tabernacleon land donated by the Turner family. What a joy and honor to share a bit of God’s working among the Oregon Indians and have their blessing and support.